Jaipur : Adding another historic landmark to its journey of last 50 years , The Institute of Company Secretaries of India (ICSI) has set Guinness World Record for Largest Taxation Lesson in Jaipur, making ICSI the first Indian Professional body to get into the Guinness World Record. The record was achieved at a mega event titled ‘Taxation Lesson – Tax Regime in India and Convergence of Indirect Taxes into GST‘ which was conducted to create awareness on GST and its finer aspects and it was also a registration camp for GST Accounts Assistant Course, which is being offered free of cost by ICSI for all students and public at large . 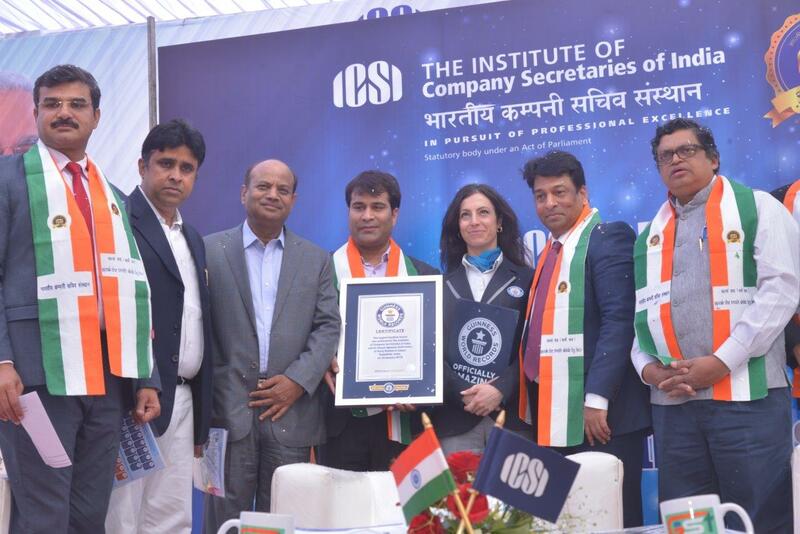 CS (Dr.) Shyam Agrawal, President, ICSI, said “We are extremely happy to announce that ICSI has added yet another Mega milestone by entering The Guinness World Record , making The Institute of Company Secretaries of India, the first Indian professional body to get into the Guinness World Records. The Golden Words of Wisdom spoken by Hon’ble Prime Minister on the occasion of Golden Jubilee Year celebrations of the Institute are Braham Vakya for each and every student, member and employee of the Institute. As desired by the Prime Minister, the Institute has taken several steps in creating vast awareness about GST”. Dr. Agrawal re- empahsised on Prime Minister Narendra Modi’s message to the nation from ICSI’s Golden Jubilee Platform where he had desired that ICSI should help in spreading awareness about the benefits of GST, taking it across the length and breadth of the country and develop professionals who can cater to GST . Mr. Modi desired that ICSI should equip over 1,00,000 students and public at large on GST. CS Gopal Krishna Agarwal, Govt. Nominee and Council Member, ICSI while addressing the august audience said that, ”Keeping in mind Prime Minister Narendra Modi’s words, while inaugurating ICSI’s Golden Jubilee Year Celebrations on 4th October, 2017, at Vigyan Bhawan, the role of Company Secretaries has become vital in promoting and maintaining compliance and transparency in the corporate sector . The Largest Taxation Lesson on GST was conducted by Mr. Bimal Jain, Chairman, Indirect Tax Committee , PHD Chamber of Commerce and Industry(PHDCCI). CS Ranjeet Pandey, Council Member, ICSI and CS Dinesh Arora, Secretary, ICSI were also present on the occasion.